Bahamas-based banker Guy Gentile broke up with Russian model Kristina Kuchma over dinner at a restaurant over the weekend — and she certainly got her revenge. 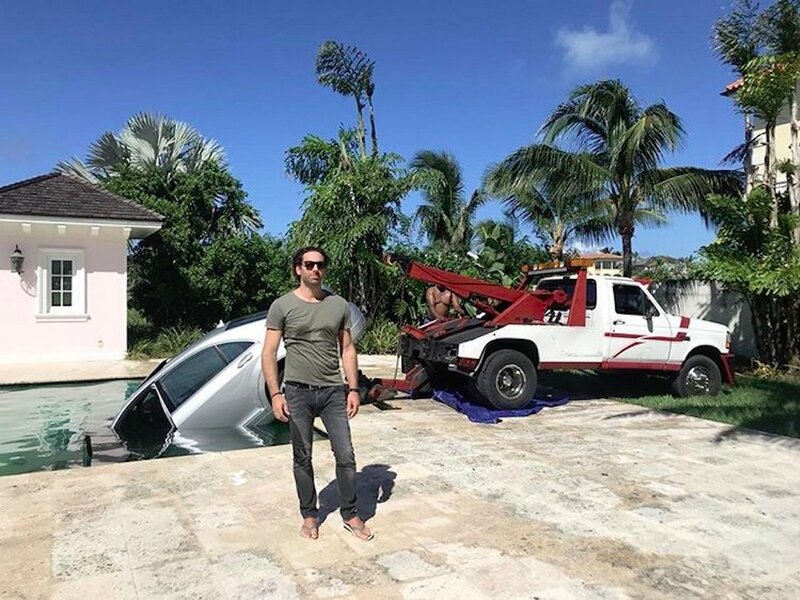 Gentille, who runs a brokerage, told The New York Post that Kuchma drove his Mercedes into the backyard swimming pool on Saturday October 7 — and it took four hours to fish it out. When Business Insider asked him about the incident, he said: "I must accept some responsibility, if a woman is not crazy, she doesn't love you. 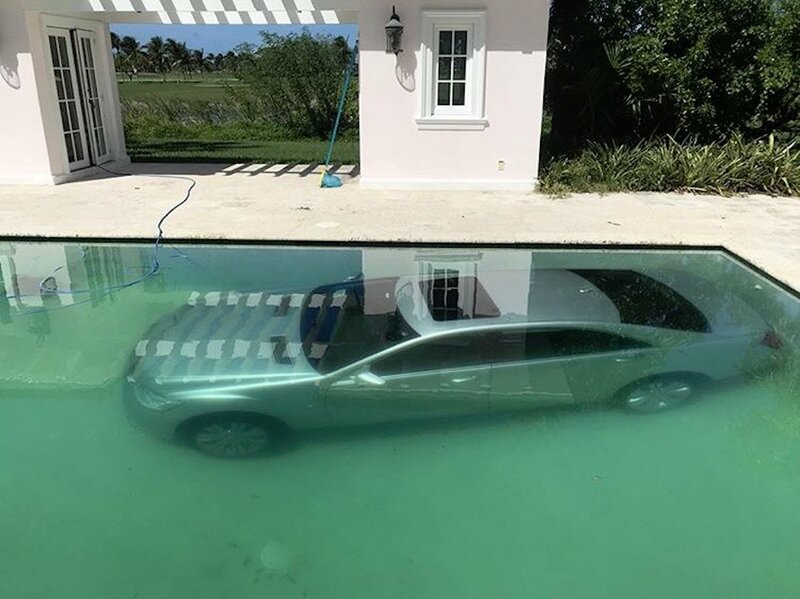 And I must've drove her crazy for her to have drove my car into the pool!" Guy Gentile lost his Mercedes to a swimming pool. In 2007, Gentile was reportedly charged with an alleged Wall Street "pump-and-dump" scheme, which involves attempting to boost the price of stocks through false or misleading recommendations. He became an FBI informant to beat the charges. He broke up with 24-year-old Kuchma during dinner at a restaurant after she asked for $50,000 (£38,000) to help start up a marketing business venture. They had been together for a year and a half. Having already bought her a Gucci bag, a new iPhone, and Beats headphones as a birthday gift, he thought the request "blurred the lines" between business and romance, he told The New York Post. "I said, 'You know what? You got the wrong guy. If you want a guy who’s going to hand you money for nothing, you got the wrong guy,'" he reportedly said. Gentile claims she then threw hot green tea in his face, and stormed off with the keys to his $55,000 Mercedes. Kuchma reportedly texted Gentile in broken English the night after crashing the car stating: "Lier! You told me you will help me to start a business! That were your words! Now you want to be an investor??? Well investor I have a surprise for you on a backyard, start with that investment idea first." He said that his "heart dropped because of [fears she was inside]. I didn’t care about the car at that moment. But after I realized she wasn’t in it, then I start to get pissed off that she would pull something like this after everything I’ve done for her." He said he came home the next morning to find his Mercedes S400 hybrid in the backyard pool. "I dumped her. She dumped my car." Police confirmed to The Post that a police report was made, and Kuchma was the only other person with access to the car, according to Gentile. She reportedly declined to comment when contacted by The New York Post. "I really loved this girl and would have married her, but she went too far," Gentile said.